In recent weeks, the bureaucrats at both the International Monetary Fund and the Organization for Economic Cooperation and Development have recommended that politicians should have a green light to supposedly stimulate growth by increasing the burden of government spending. Since the lavish (and tax-free) salaries for IMF and OECD bureaucrats are made possible by those same politicians, it’s hardly a surprise that the international bureaucracies cranked out their justifications for bigger government. Now it’s time to see which nations actually decide to roll the dice with a Keynesian spending binge, and it looks like Canada is at the top of the list. As reported by Bloomberg, the new Prime Minister thinks more spending will “stimulate” growth. Canadian Prime Minister Justin Trudeau is urging global leaders to rely more on government spending…to spur growth… He also defended his plan to go willingly into the red. …Trudeau’s arrival on the global scene and his endorsement of deficits marks a sharp about face from his predecessor, Stephen Harper. Along with German Chancellor Angela Merkel and U.K. Prime Minister David Cameron, Harper championed the budget austerity alliance within the Group of Seven that often clashed with the U.S. on fiscal policy. Needless to say, the former Canadian Primer Minister was right and Obama was – and still is – wrong. And while they certainly aren’t advocates of small government, Angela Merkel and David Cameron also were wise to impose a modest bit of spending restraint in recent years. Now we’ll see what happens to Canada as government gets bigger. Here are some of the specific details about Trudeau’s proposed spending binge. Trudeau, 44, hinted he is considering expanding on pledges that have his country on pace for a deficit of nearly C$30 billion ($22.3 billion) in the fiscal year that begins April 1. Having promised C$10.5 billion in new spending during the campaign…”we need to be investing intelligently in infrastructure, in money in the pockets of the middle class, to grow the economy,” Trudeau said of the fiscal situation. And he explicitly invokes the discredited Keynesian argument that a larger burden of government spending somehow boosts economic performance. Statistics Canada reported that output grew just 1.2 percent in 2015, down from 2.5 percent in 2014. To Trudeau, that’s a reason to spend more instead of tightening up to eliminate the deficit, as Harper had argued in last year’s election campaign. “Cuts would have been terrible for the economy,” Trudeau said. What makes the Canadian developments so tragic is that the country has been a comparative success story in recent decades. Canada is now one of the world’s most economically free nations thanks to relatively sensible policies involving spending restraint, corporate tax reform, bank bailouts, the tax treatment of saving, regulatory restraint, and privatization of air traffic control. Heck, Canada even has one of the lowest levels of welfare spending among developed nations. Most remarkable, the country’s biggest progress on spending actually took place when Trudeau’s party was in charge in the 1990s. And now Trudeau wants to reverse course and put Canada’s progress at risk. P.S. It’s good news (or, to be more accurate, a lesser form of bad news) that Trudeau’s Keynesian agenda involves infrastructure spending since there’s at least a possibility that such outlays may generate a positive return. If he was proposing a lot of redistribution spending, by contrast, that would represent bad policy from both a micro and macro perspective. I’m still trying to figure out how the sane people of this country gave this “inexperienced into himself egomaniac”a mandate to do whatever he wants to do and he is going to get great press on 60 minutes tomorrow to further boost an already inflated ego! Then you have a lot of US folks looking to Donald Trump to lead them???? I honestly thinki the whole world is going to hell in a hand basket. I did not vote for Trudeau & I am so very glad because he is proving to me and a lot of other Canadians that he is being paid for lip service & not a of a heck lot more! Hate to think of where we will be 4 years from now. Even lucky Electorates are always just a mere hairline away from destroying hard earned prosperity. It’s the Canadians’ turn to step on the banana peel. Infrastructure spending is just as Plunkett of Tammany Hall, describes it, honest graft. It lines the pockets of the connected and does nothing. See the Big Dig Boston. Billions that created what? Nitpick: I wouldn’t ever say that infrastructure spending would create a positive return. At best, it will be better than just lighting the cash on fire. Justin Trudeau is a disgrace, an embarrassment and he lacks intelligence. Really. He might be PM like he his dad (that too was a disaster) but he didn’t inherit his dad’s brains or anyone else’s-can you tell I didn’t vote for him? He is a spoiled, smirky rich kid who never worked a day in his life. 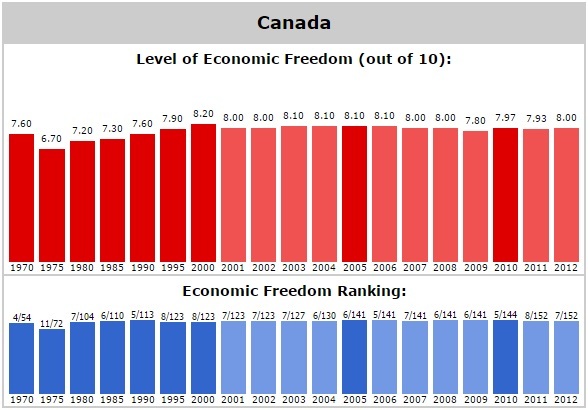 On your chart, Canada’s economic freedom hit bottom in 1975. Guess who was PM then? Justin Trudeau’s father and he racked up scary deficits and they became a large debt- which stopped and even reversed course in the 1990’s and early 2000’s. Canada paid off some of it’s debts with surpluses then and our budget was once again supposed tobe balanced or almost balanced but JT is going to change that.